In a desert, water is life. Studying and measuring its quality and flow become vital activities, and nowhere is this truer than in Nevada. “Since Nevada is the most arid state in the U.S., water here is very important,” says Rose Medina, a physical scientist with the United States Geological Survey (USGS) in Carson City, Nevada. She’s understating the case considerably. Municipal and state governments in the region depend on USGS hydrology reports to make life-and-death decisions about whether and when to treat water and how to secure a long-term, quality supply. Since June 2009, ThoughtFarmer has been helping make this essential work easier for the USGS’s staff of scientists, technicians and support personnel in four offices across the state. 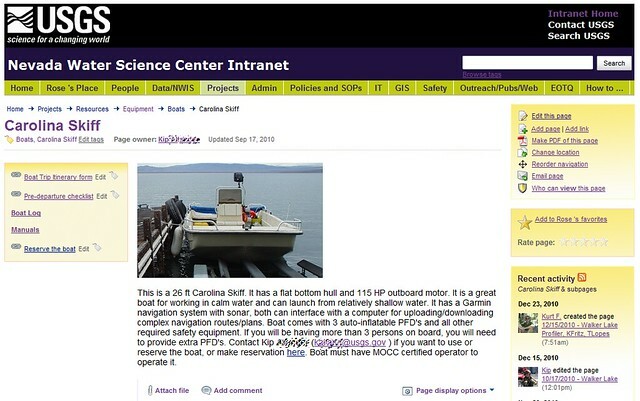 The Water Sciences group intranet, simply referred to as “ThoughtFarmer”, has become the go-to resource for everything from HR information, to signing out a digital camera or boat, to checking the budget on a project, to getting a virtual introduction to a colleague on the other side of the state. “It has really been even more successful than we thought it would be,” says IT specialist Shannon Watermolen who along with Medina spearheaded the intranet implementation project and manages ThoughtFarmer. The social intranet search team chose ThoughtFarmer over alternatives it considered such as Atlassian’s Confluence, PBwiki’s PBWorks and Jive, “primarily because of how customizable the look of ThoughtFarmer was,” Medina says. That was in stark contrast to the agency’s old intranet, a closed Web site hosted on a local USGS server with pages built from scratch using Dreamweaver. It was mostly static because it was so hard to update – only Medina and Watermolen could do it. Still, it was familiar and accepted. ThoughtFarmer’s suitability to the job was borne out in focus groups in which both tech-savvy and non-technical employees alike said they preferred it to the alternatives. Anybody in any of the Nevada offices can post to any page on the intranet – except the home page, which the administrators still control – and create their own pages whenever they want. Democratization was a large part of the point of the new social intranet project. The USGS wanted to get employees directly involved as a way to help build community and foster collaboration, especially among scientists working in different offices. But the initial results of democratization in fact go straight to the bottom line. It’s not the only significant time savings. The intranet is helping make almost everybody in the organization more productive. In the past, if there was important information she had to get out to employees, she’d print signs and post them on doors and bulletin boards around the facilities. “We don’t do that anymore,” Masters says. ThoughtFarmer is the agency’s bulletin board now. She and her team post virtually all their information on the intranet and direct employees where to find it. Masters reels off a partial list: links to the department’s forms database, information for new employees about benefits and required training, instructions on how to use agency systems, links to a purchasing and requisitions system, Word templates for creating standard department documents, and on and on. It’s not just the authors of information who are saving time. Employees now don’t have to pick up a phone or compose an e-mail to ask for help or information, or walk down the hall to collect a paper form. They know where to find what they need in ThoughtFarmer and can get it much faster than before. The intranet has also streamlined processes that used to be cumbersome and paper-bound, such as scheduling and signing out equipment needed for project work. It’s not always admin or IT staff initiating these improvements either. Kip Allander is a hydrologist working out of Carson City. His focus is the Walker River basin, an ecologically fragile but essential water system. Most of Allander’s productive time is spent working on a computer-based model that helps scientists figure out what might happen next with this vital resource. As in any organization, though, even highly-trained specialists like Allander have ancillary duties. One of his is managing access to a boat he and other scientists use when doing field research. In the past, they had to come to his office and fill out a paper requisition form and file a float plan or itinerary. Now they use an interactive calendar Allander created in ThoughtFarmer to book the boat online with a few keystrokes and fill in an electronic float plan. It took him about an hour to design the calendar application, and some additional time to scan and upload documents such as the technical manuals for the boat and its scientific equipment. Overall, usage of ThoughtFarmer has been satisfyingly high, and Medina and Watermolen believe the USGS has easily recouped its investment in the product. But they are candid in admitting it has not transformed the organization in all the ways they hoped. “The biggest undertaking in any kind of social media project, in any organization, is getting people to let go and let down and just talk – put it out there,” Medina says. Younger, tech-savvy employees have now posted personal pages. And that has become a popular way to quickly get to know a new employee or an unfamiliar colleague in another office you’ll soon be working with on a project, Watermolen says. Some scientists have enthusiastically embraced ThoughtFarmer, using it as project central, a place to store and link project-related data, track progress, keep a diary of field work and write and post reports for others to see. But it has not been used as much yet for collaboration across offices and there is huge potential there for benefit, Medina believes. That is starting to happen, but it’s devilled in part by relatively poor uptake among employees outside the Carson City office, which is headquarters for the Water Sciences group – and where Masters, Medina and Watermolen all work. Henderson, near Las Vegas, the state’s other major USGS office, was plagued early on by a poor network connection that meant ThoughtFarmer wasn’t as responsive as it should be. That problem has now been fixed, Watermolen says, and usage there is picking up. In the meantime, she and Medina are more than happy with the results so far, they’re encouraged by the progress toward achieving even better results – and they’re effusive in praise of ThoughtFarmer. “We love this product,” Watermolen says. One of USGS Nevada’s special requirements was that other offices outside the state be able to view its intranet and access data posted there – without actually being full-fledged licensees of the software. ThoughtFarmer could have just said no, Medina says, but instead came up with a fair solution, now available to other customers, to allow ‘guest’ users who can view but not edit or add to intranet content. “So now everybody in the United States Geological Survey can see our intranet,” Watermolen says. As an agency of the United States Federal Government endorsements of specific commercial products are prohibited. The opinions of the US Geological Survey employees highlighted here reflect their personal opinions and do not constitute an endorsement of ThoughtFarmer or its developer by the USGS.